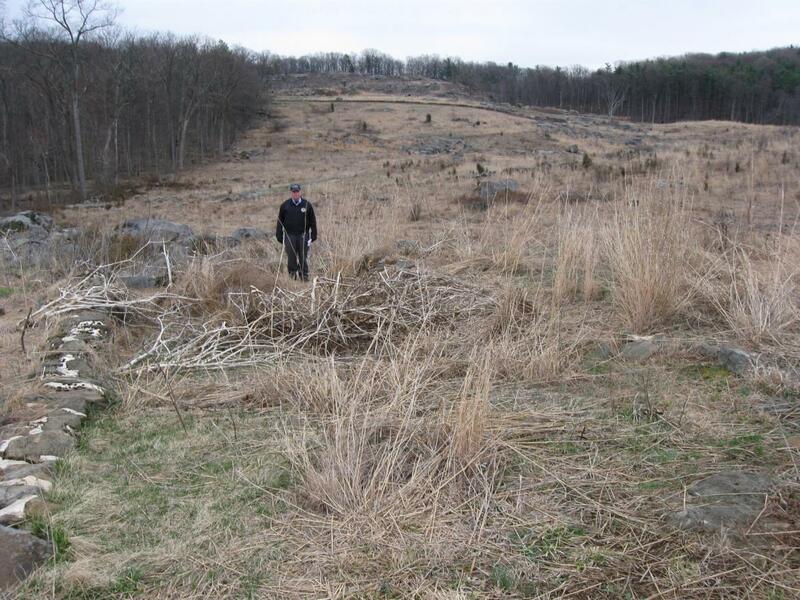 Gettysburg Licensed Battlefield Guide Fred Hawthorne is standing at the eastern foundation wall for the Timbers Farm. Houck’s Ridge/Devil’s Den is in the middle background. Little Round Top is in the background. This view was taken facing southeast at approximately 5:30 PM on Friday, March 25, 2011. To see the other 140 Places Every Guide Should Know posts, click here. 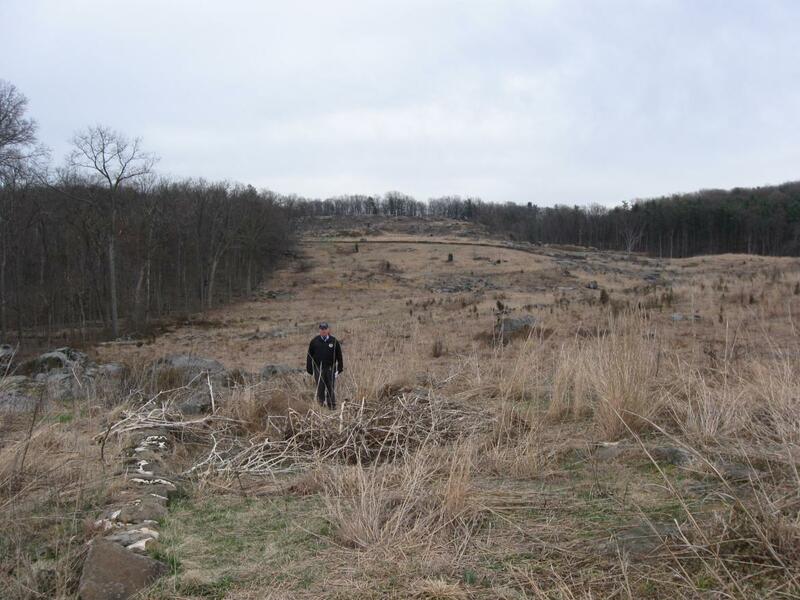 In today’s 140 Places Every Guide Should Know post, Gettysburg Licensed Battlefield Guide Fred Hawthorne shows us the Timbers’ House Foundation, and the rock on which some bodies of field officers in the 124th New York were placed during the fighting near Devil’s Den on July 2, 1863. This map shows us the locations taken of the videos for the 140 Places Every Guide Should Know series. Videos #1-#30 were shown in our previous 140 Places Every Guide Should Know posts. Video #31 was taken at the Timbers’ Foundation. Video #32 was taken at the monument to the 124th New York Infantry Regiment. This map was created facing north at approximately 4:30 AM on Friday, April 8, 2011. 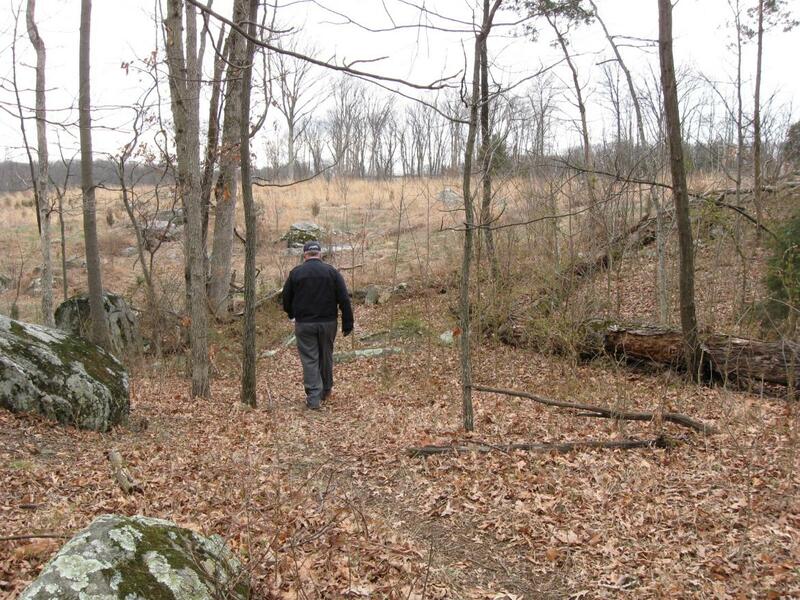 To get to the Timbers Farm, we are walking down (south on) Brooke Avenue, away from the position of our previous posts where Fred showed the Brooke Rock and the advance marker for the 27th Connecticut. 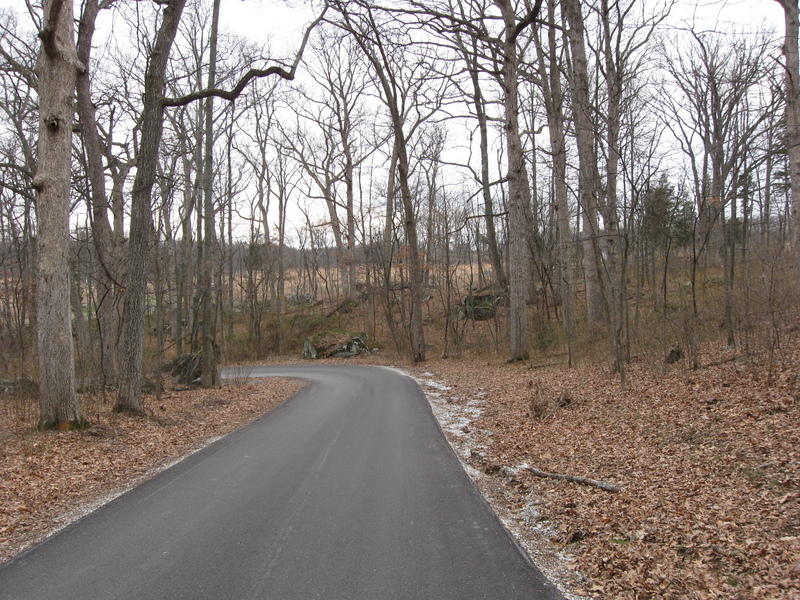 Instead of following the road around the curve to the left, we’re going straight into the woods. There is are some large rocks in the woods to the front right of the road. This view was taken facing southwest at approximately 5:30 PM on Friday, March 25, 2011. 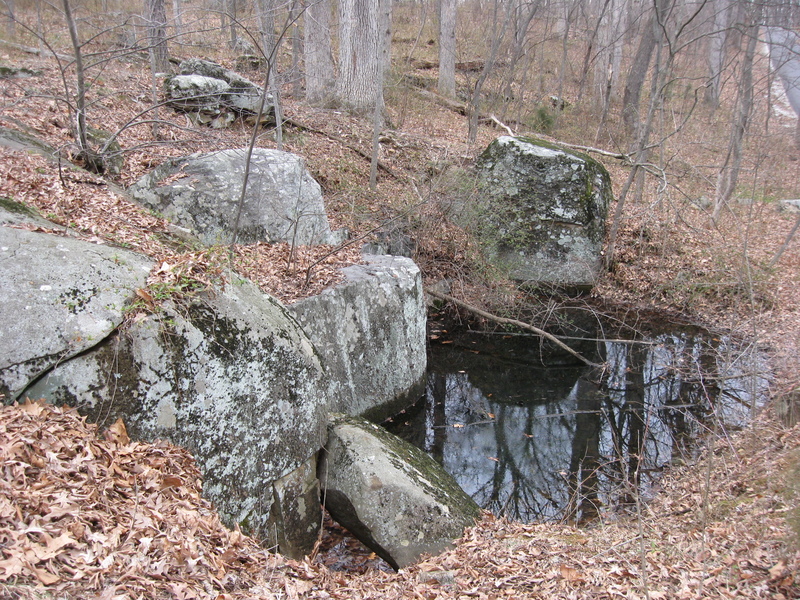 These rocks make up part of William Wible’s Rock Quarry. Brooke Avenue is barely visible in the right background. We walked down Brooke Avenue to this location. This view was taken facing northeast at approximately 5:30 PM on Friday, March 25, 2011. Fred Hawthorne has passed the quarry and is walking up to the open area on the other side of the woods. This view was taken facing southwest at approximately 5:30 PM on Friday, March 25, 2011. The foundation isn’t easy to find, even after one has been here multiple times. It took us a couple of minutes. Fred is standing near the east wall of the foundation. The door would have been to the right of Fred. The photographer is standing near the west wall of the house. This view was taken facing southeast at approximately 5:30 PM on Friday, March 25, 2011. 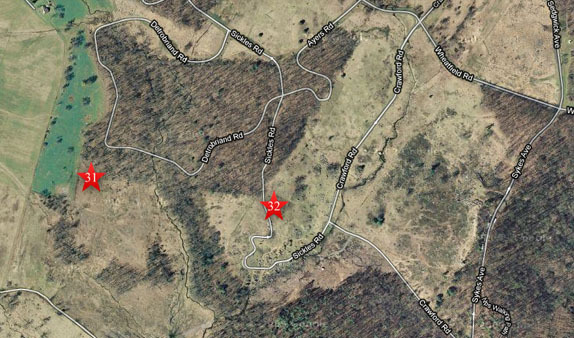 In Video #31 (Videos #1-30 were shown in our previous 140 Places Posts) Gettysburg Licensed Battlefield Guide Fred Hawthorne shows the location of the Timbers Farm. This view was taken facing southeast to south to north to southeast at approximately 5:30 PM on Friday, March 25, 2011. We are looking across the foundation from the south wall of the house (closest to us) and the larger stones of the foundation on the north wall. 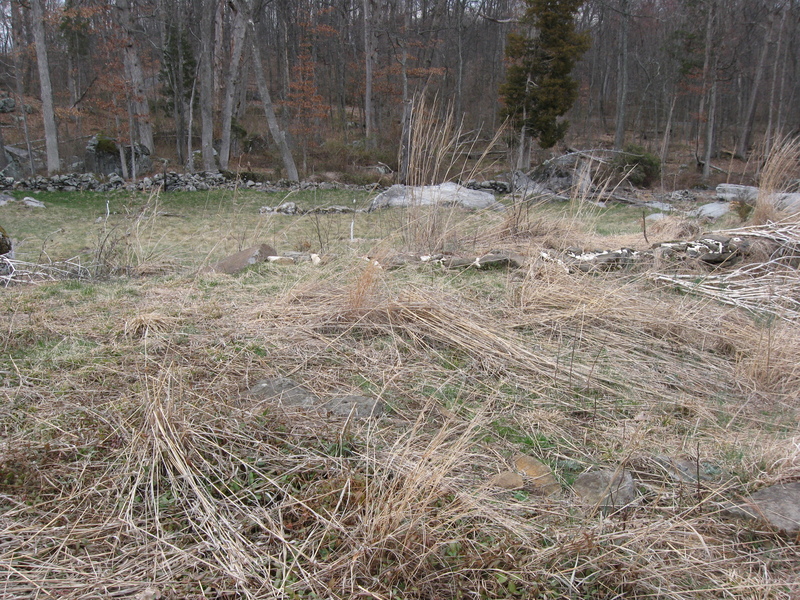 Behind (north of) the house location (owned by George Weikert at the time of the battle) is an open area… This view was taken facing north at approximately 5:30 PM on Friday, March 25, 2011. 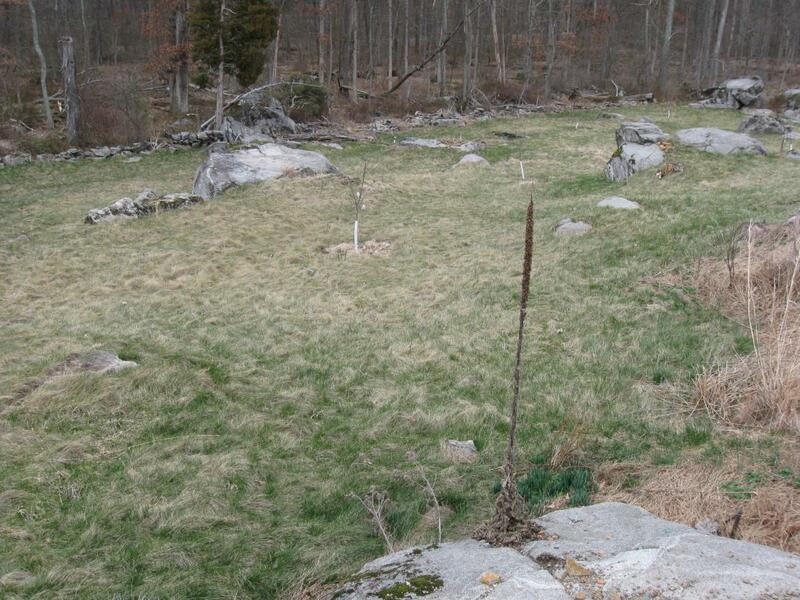 … that the National Park Service has planted in the last year or so with fruit trees. This view was taken facing northeast at approximately 5:30 PM on Friday, March 25, 2011. 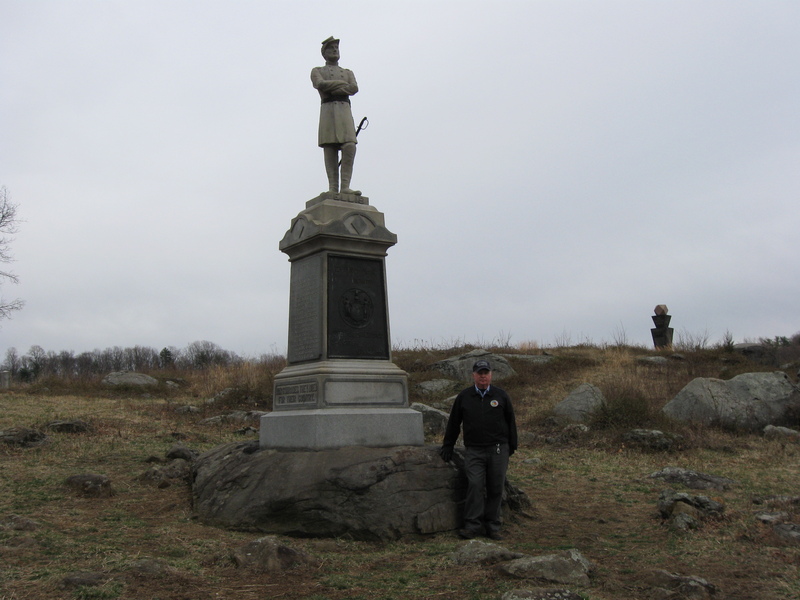 Licensed Battlefield Guide Fred Hawthorne is standing by the monument to the 124th New York Infantry Regiment which was dedicated on July 4, 1884. The monument is located on the west slope of Houck’s Ridge. Devil’s Den is out of sight on the right. The top of the monument to the 99th Pennsylvania Infantry Regiment (dedicated September 11, 1889) is in the right background. This position actually covers two locations mentioned in Fred’s 140 Places: The only monument to a regimental commander on the field, and the rock where the bodies of Cromwell and Ellis were placed. This view was taken facing southeast at approximately 5:30 PM on Friday, March 25, 2011. 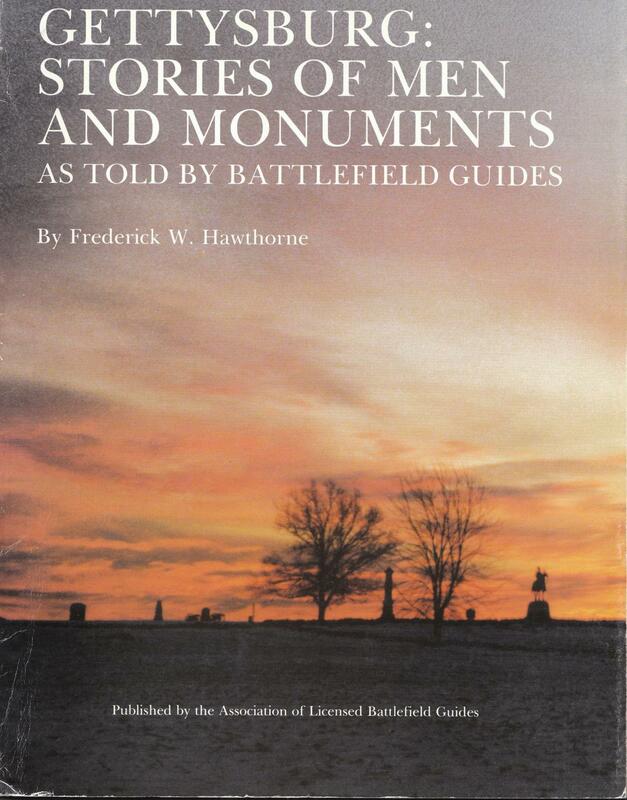 In Video #32 Licensed Battlefield Guide Fred Hawthorne is standing on the west slope of Houck’s Ridge near the monument to the 124th New York Infantry Regiment. He shows us the rock where he believes the bodies of Colonel A. Van Horne Ellis and Major James Cromwell were placed during the fighting here on July 2, 1863. This view was taken facing southeast to southwest to east to southeast at approximately 5:30 PM on Friday, March 25, 2011. As of now, there are 146 places/facts on the list, and they are not in any particular order.